More than 40 Hill East residents gave up their Friday evenings in order to meet with DC Department of Behavioral Services representatives and the leadership of Andromeda Transcultural Health Services to express their concerns about the plan to establish a recovery center in Hill East. Located at 15th and South Carolina Avenue, SE, (the intersection of Independence and Massachusetts Avenues and 15th Street, SE) the proposed center would provide services – counseling, job training, life skills, exercise, nutrition advice – to outpatients recovering from substance abuse and mental health issues, and who are considered “stable.” Contrary to rumor, it would not dispense methadone or any other medication. The community meeting was organized by ANC6B Commissioners Chander Jayaraman and Denise Krepp, though only Jayaraman was present last night owing to a prior commitment that kept Krepp away. 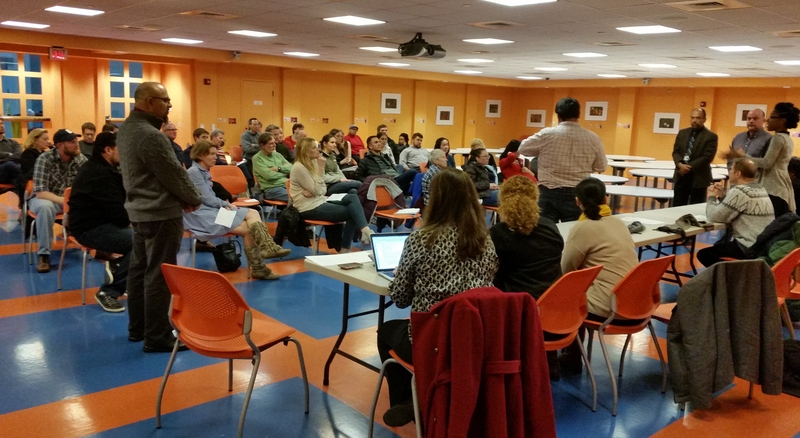 The location of the proposed center was the major concern expressed by residents. 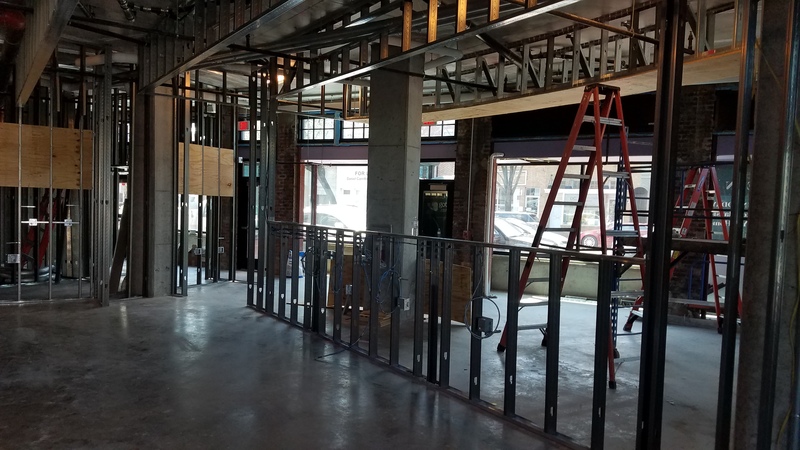 15th Street is a commercial corridor, and the facility is moving in as a matter of right, just as any other business could do, if properly licensed to operate. 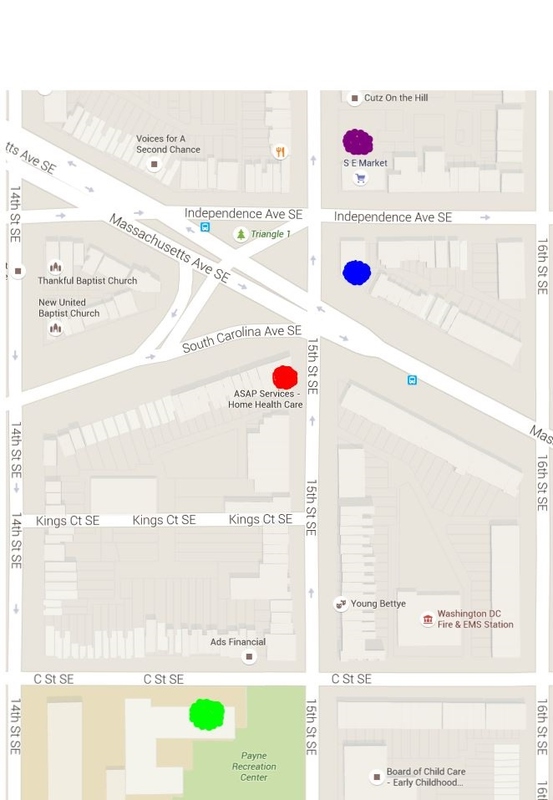 But neighbors cited the administrative offices of the social services agency Community Action Group (CAG) a block away, the methadone clinic and open air drug market at DC General four blocks away, and another substance abuse recovery service facility at 12th and Pennsylvania Avenue, SE—suggesting that the concentration of social services within a four block radius invited problems, including illicit drug markets that prey upon clients of these facilities. Several attendees also pointed to the proximity of local schools, and in particular Payne, which lies less than a thousand feet away. Adding to neighbors’ concern is the recently announced plan to open 24 hour 7-11 “sandwiched” between CAG and the site of the Andromeda center. A corner store selling beer and wine also lies between the two locations. Like the substance abuse treatment center, 7-11 is occupying this location as a matter of right. 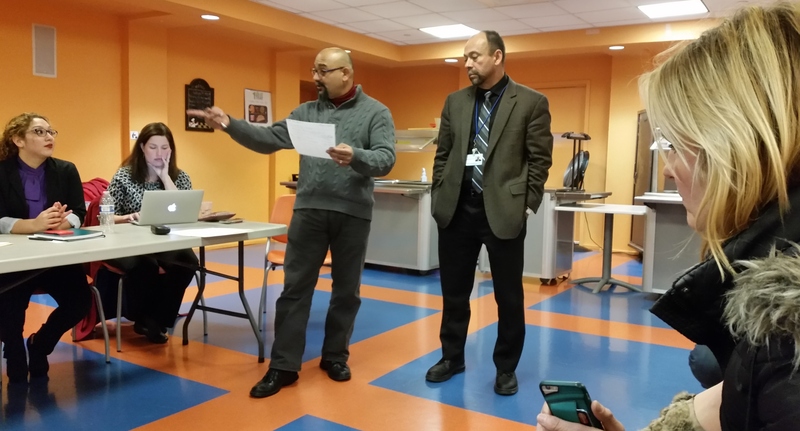 At the meeting last night, residents expressed appreciation for the work of the clinic and a desire to learn more. 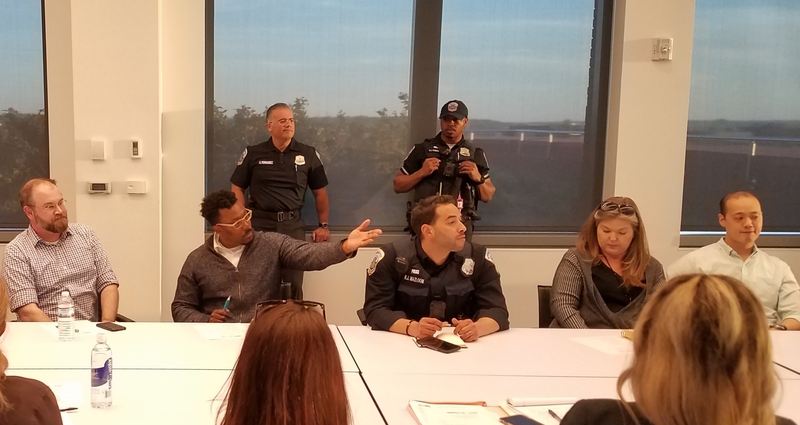 Several people noted the persistent problems centered around the intersection of 8th and Pennsylvania Avenue, SE, in the area of Community Connections, Metro Park, and another local 7-11 convenience store (reported on here: http://bit.ly/1UFeHD5). On hand to explain the relationship between the city and the service provider was Ms. Phyllis Jones, Chief of Staff of DC Behavioral Health. Jones’ agency is in charge of certifying the health care provider, a process which depends on the applicant’s ability to demonstrate they have the ability to deliver services, attract a client base, and the accessibility of the facility to its clients. Jones said that DBH factors in community input in the form of letters from advocates, agencies and neighbors, but “opposition from the community is not a sufficient reason to deny certification.” Although Andromeda has been operating for 20 years in Adams Morgan, certification of the new location is not automatic and must be assessed on its own merits. As of yet, Andromeda has not applied for certification, though they have entered into a three year, $6000 a month lease for the location and spent some $55,000 on cosmetic work on the building. 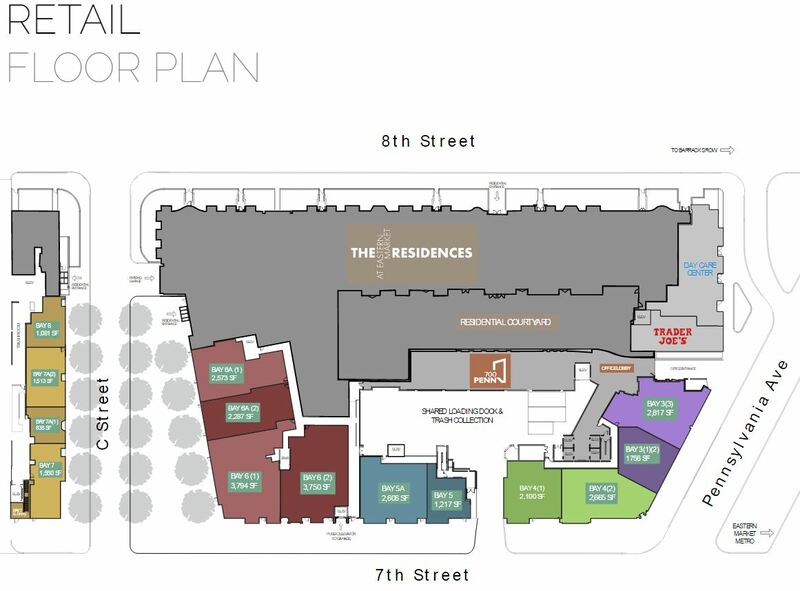 According to Jones, much of the justification presented for establishment of a treatment center in a community is “people have a right to be treated where they want to be treated.” The Hill East center anticipates clients from Wards 6, 7, and 8, who currently have to travel to Andromeda facilities on 14th Street, NW; one third of Andromeda’s clients reside in those three wards. Andromeda staff told the residents that they expect to have a maximum of 100 patients enrolled and that 35 to 40 visits per day is the norm. The hours of operation for the proposed center will be 9am – 7pm, Monday through Friday and 9am to 1pm on Saturday. It seemed clear that some of the attendees at last night’s meeting intended to continue exploring ways to stop the certification. To that end, there was considerable support for seeking the intervention of CM Charles Allen. In addition, some in the crowd saw proximity of the clinic to Payne School as being inconsistent with city regulations. Jayaraman said he would ask ANC6B to seek an opinion from the DC Attorney General on that question. The matter is likely to come before ANC6B when it meets next Tuesday, at 7:00pm, in Hill Center. Thanks for this first rate summary of the meeting. Also thanks to Chander Jayaraman for arranging the meeting and ably chairing it. The day care facility at 308 15th Street (across from Payne Elementary) should be highlighted on the map. Under this half baked plan, the toddlers’ daily excursions would get more interesting. I’d rather have a social services provider than another 7-11. The one on 8th Street is an open-air drug market and the one at Remington’s is a reminder of the erosion of the Hill’s character. Ugh.